Carpet cleaning is an important part of protecting your investment, particularly if you're looking for longevity. With this in mind, it's important to adopt an effective cleaning and maintenance regime – something beyond vacuuming once a week – to ensure that you keep your carpet in great condition for as long as possible. Whether you're determined to maintain a new carpet or want to give a new lease of life to a tired looking carpet, our step-by-step guide to how to clean a carpet will make it simple and hassle free. Find more step by step cleaning guides and hacks on our dedicated hub page. Take a look at the Real Homes pick of the 50 best cleaning products for your home, too. Ideally you should wash your carpets every three to four months using a domestic carpet shampoo machine. If you have kids and pets rolling around a lot it may be a good idea to wash your carpet more often than every three months. In fact, you might like to read our guide to cleaning up after dogs and cats for more specific carpet-cleaning tips and advice. It’s a good idea to buy a shampoo that includes a carpet protector – for example Scotchgard – as this will help protect your carpet from future stains. For wool carpets choose a cleaning solution that is wool safe. This way you will know it has been tested and approved for carpet care specifically on wool (all Vax cleaners are wool safe). Have a read of our guide to carpet cleaning machines if you're not sure what to choose. Failing that, look for a decent carpet cleaning solution – check out our list of the very best. If you don’t want to buy your own carpet washer you can also hire a machine such as the Rug Doctor from B&Q. They’re usually £30 for a 24 hour rental including detergent. The first thing you need to do before you begin cleaning your carpet is clear the area as much as possible. Stack chairs upside down on the table, remove rugs and any small objects that are lying around. It's important to ensure that small objects won't be sucked up and damage the vacuum cleaner. Try and remove any dents and impressions left on the carpet by heavy furniture by rubbing an ice cube over the area. It's officially our favourite natural deodoriser – sprinkle it on carpets for an hour before vacuuming, and that lived-in smell will disappear. Don't miss our guide to cleaning a whole house with bicarbonate of soda. And find more ways to get rid of household smells in our guide. To remove any surface dirt, quickly vacuum the area before you begin carpet washing. This will also stop your carpet washer getting clogged up. Want to know how to vacuum like a pro? Check out our guide. Need a better vacuum cleaner to get the job done thoroughly? Don't miss our vacuum cleaner reviews and buyer's guides – we've found the best vacuum cleaners, whatever your needs. Ideally, you should remove any stains from your carpet such as tea, wine and ketchup as soon as they happen. Treat the stain with a carpet cleaner straight away, which will lift the liquid out immediately. You can also iron out stains in the carpet by soaking a cloth or flannel in water, placing on the stain and running a hot iron across it. The heat will start to break up the stains, making the carpet easier to clean. This is a great way to remove spilt wax too. Find more ways to clean without using chemicals in our guide. If you do not have a carpet cleaner available, blot (don't rub) the stain until you have removed as much of it as possible. Dilute the stain with warm water mixed with a small amount of white vinegar and blot some more. Find out more about cleaning your home with vinegar in our guide. 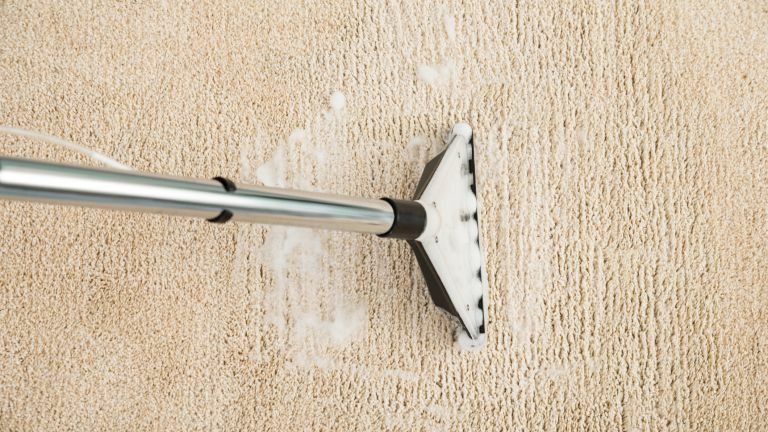 Remove any tough marks and stains you can see with a pre-treatment before you begin deep cleaning your carpet. A treatment such as Bissell Pre-Cleaner would be ideal. This will loosen the stain making it easier for your carpet cleaner to fully wash it away. Once you have applied the pre-cleaning solution to your carpet, leave it to work its magic for 15 minutes. Be careful not to over-wet the carpet as this could make dye from the underlay seep through. If you are using a carpet washer for the first time, read the instructions fully and make sure everything looks like it’s in good working order. Rinse the tanks and check the filter and brush bar are clear. If there are any obvious problems consult the equipment’s manual. To begin, simply fill the water tank on your carpet washer with warm water and your choice of cleaning solution. Start in the far corner of the room and work your way back to the door. This will prevent any accidental soggy socks! Move backwards and forwards, slowly holding down the trigger to spray the cleaning solution. Release the trigger and pull the washer backwards over the carpet. Continue moving backwards and forwards, repeating up to four times in each area. To dry your carpet open the windows and ventilate the room with fresh air. If it’s too cold for that put the central heating on and leave for a few hours to speed up the drying process.